have used foliar S|3N abundances to show that, compared to temperate forests at least, nitrogen is relatively abundant in many tropical forest ecosystems. It is, however, clear that this generalization does not apply to all moist forests. For example, Tanner et al. (1998) argue that, due to slow rates of nitrogen mineralization at high altitudes, nitrogen, rather than phosphorus, is likely to constrain production of many montane tropical forests. A further refinement has come from chronosequence studies in Hawaii (Crews et al., 1995; Herbert and Fownes, 1995; Raich et al, 1996; Vitousek and Farrington, 1997). From studies of soil phosphorus biogeochem-istry, tree nutrient status, and fertilization experiments, this work suggests that forests on younger soils are limited by both nitrogen and phosphorus. But consistent with the theory of Walker and Syers (1976), discussed also in Sec. 2.3, forests on older soils seem to be limited only by low phosphorus availability (Herbert and Fownes, 1995; Vitousek and Farrington, 1997). This conclusion is based, at least in part, on the observation that forests on older soils show increased growth in response to phosphorus but not to nitrogen fertilization (Herbert and Fownes, 1995). But at the individual plant level, it is also often observed that climax-tree species native to both moist and dry tropical forests may show little if any growth response to increased soil phosphorus availability (Rincon and Huante, 1994; Huante et al, 1995; Raaimakers and Lambers, 1996; Veenendaal et al, 1996). Thus, as was discussed in Sec. 3.2, it may actually be that most plants adapted to low-phosphorus tropical forest soils, while having adaptions to such soils such as lower inherent growth rates and higher root-shoot ratios may not be able to substantially increase that growth in response to higher phosphorus levels (Veenendaal et al, 1996). In this context, one can still regard the low productivity of some tropical forests as being a consequence of low nutrient availability, but analyzing the extent of nutrient constraints on ecosystem productivity by means of fertilizer experiments might be misleading. Perhaps the exceptionally low species diversity in tropical forests in Hawaii is the reason for the large growth responses in response to P fertilization observed by Herbert and Fownes (1995) for trees growing on the older soil there. Despite probably being well adapted to nutrient-poor soils, there is no doubt that trees growing on oxisols or ultisols have very low foliar P concentrations (Sec. 3.2). For example, their average value of 0.5 mmol P mol-1 C is substantially less than the P requirement for adequate growth of most plants, which is considered to range from 2 to 4 mmol P mol-1 C (Marschner, 1995). Indeed, even when compared to other tropical tree species, these values are in the range generally considered to be "deficient" (Drechsel and Zech, 1991). It is likely that these low concentrations of leaf phosphorus are limiting for photosynthesis. 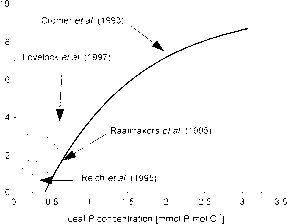 This is shown in Figure 2, where the photosynthesis/phosphorus relationship is shown for the laboratory studies of Cromer et al (1993) and Lovelock et al (1997) and the field studies of Raich et al (1995) and Raaimakers et al. (1995). The curve for Cromer et al (1993) comes from their Figure 6, viz. FIGURE 2 The relationship between leaf photosynthetic rate and leaf phosphorus concentration of tropical trees (from Cromer et al., 1993; Raaimakers et al., 1995; Raich et al., 1995, Lovelock et al., 1997). where A is the photosynthetic rate in ptmol mol-' C s-1 and [Pj is the leaf P concentration in mmol P mol-1 C.
Both of the field studies were carried out in moist tropical forests growing on oxisols and these can thus be considered representative of the sort of relationships that can be expected for plants growing on highly weathered soils in the moist tropics. By contrast, the relationship of Cromer et al. (1993) comes from a nutrition experiment using Gmelina arborea, a fast-growing seasonally deciduous tree often characterized by exceptionally high levels of foliar P (Drechsel and Zech, 1991). Of an intermediate nature is Beilschmiedia pendula, a common species of the humid forests of Panama (Lovelock et al., 1997). Other things being equal, the methodology of Lovelock et al. 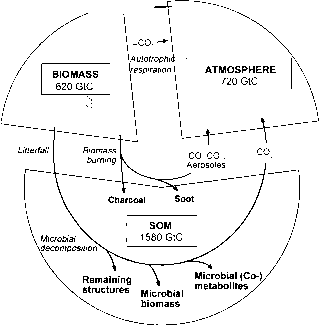 (1997) would have yielded higher rates, as photosynthesis was measured in a leaf disc electrode at saturating [CO,]. Despite different methodologies and genetically different plant material, the photosynthesis versus leaf phosphorus relationships are surprisingly consistent, especially when it is considered that the methodology of Lovelock et al. (1997) should have given rates higher than the other studies. Given that a typical foliar P concentration for a moist tropical forest growing on an oxisol soil is only 0.5 mmol P mol-1 C, the low phosphorus concentrations typically encountered in moist tropical forests on infertile soils are thus almost certainly limiting their rates of carbon acquisition. Nevertheless, moist tropical forests growing on infertile soils also have a high leaf area index (LAI) and rates of carbon acquisition are remarkably similar to those in temperate zone broadleaf forests (Malhi et al., 1999). But the relationship of Figure 2 also suggests that for many tropical forests which have foliar nutrient concentrations of about 0.5 mmol P mol-1 C, these nutrient concentrations are close to being critically low. Any reduction in phosphorus availability would therefore be expected to be reflected in dramatic reductions in canopy photosynthetic capacity, as a consequence of either a reduction in the total leaf area or a decrease in foliar P concentrations. From studies of bana forests that grow on very low fertility spodosol or psamment soil types in Venezuela, it would seem that the former explanation is the case. Total canopy phosphorus is much lower for forests growing on oxisols or utisols, with leaves of these forests typically having phosphorus concentrations similar to those of forests growing on the relatively more fertile oxisol/ultisol soil types (Vitousek and Sanford, 1986). Thus, rather than reducing their foliar P concentrations below about 0.5 mmol P mol-1 C, these forests adjust to very low levels of phosphorus availability by having a relatively low LAI (Medina and Cuevas, 1989).